Maryland-farmed oysters, wine, champagne, and beer—what more do you need to satisfy the soul on a late January afternoon? You can have them all and Smith Island cake, too, at the Chesapeake Bay Foundation’s second annual Oysters and Wine on the Eastern Shore January 27. The event takes place from 2 to 5 p.m. on Sunday, January 27 at the Eastern Shore Conservation Center in Easton, MD. Tickets cost $35 and advance registration is required because the event is expected to sell out. This year’s event will feature oysters from three Maryland oyster farms—Chestertown’s Orchard Point Oyster Company, Tilghman’s Fisherman’s Daughter Oysters, and Toddville’s Honga Oyster Company. All three businesses are part of the state’s burgeoning oyster farming industry. The industry grew from a nascent start in Maryland less than a decade ago when upstart operations produced about 4000 bushels of farmed oysters in 2012. That number has since ballooned to more than 64,000 bushels from oyster farms in 2016, according to the latest annual harvest data released by the state’s Department of Natural Resources. Since 1999, the oyster population in Maryland’s portion of the Bay has declined from about 600 million oysters to the current population of 300 million, according to the state’s new oyster stock assessment released in November. Wild oyster harvests continue to significantly outpace harvests from aquaculture operations—for example, about 224,000 bushels were harvested from public bottom in 2016, nearly four times the amount from oyster farms. The January 27 event will celebrate locally farmed oysters by pairing them with a variety of wines, champagne, and local craft beer. There will also be hors d’oeuvres and live music. Space is limited and advance registration is required. 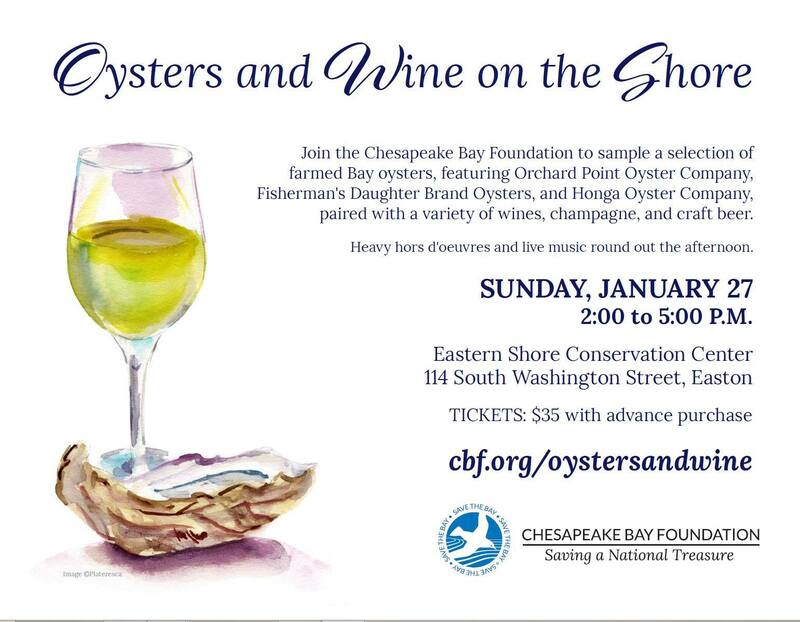 Purchase tickets ($35) at cbf.org/oystersandwine.